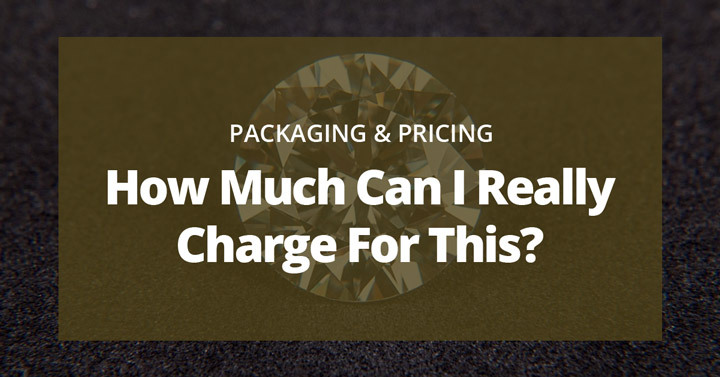 When it comes to pricing, how much do you charge? Those two methods can be a great indicator of what you should price. But how about a third method? Ready? What your competitor charge is not a great indicator of what your market will pay. Also, your personal beliefs about your market is also not the reality of what your market will pay. Just because you won’t spend $2,000 on a purse, doesn’t mean someone out there won’t. That’s why you must test prices as much as possible. What’s unfair to one person is totally fair to the next. If you’re a coach/consulting business, you especially need higher rates – they need to know you’re good. For example, would you trust a $10/hour personal trainer over a $100/hour one? When you’re selling non-tangible items like ‘advice’ or ‘consulting’ this is critical. Your customers don’t know what you know, that’s why they’re hiring you! That means they don’t know enough to ‘pick’ the right person – so they’ll go the the person with the best reputation, authority – or prices. It’s human nature to say price = value (especially if they don’t know anything about the subject). With that said, it’s best to keep your rates above average (you’ll be taken more seriously).